On a cross-country trip from Vermont to Oregon, friends invited us to break up the trip midway with a stopover at their home in Lincoln, Nebraska. 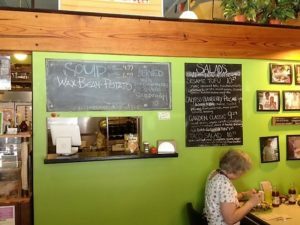 Our friends, who belong to a local CSA farm and love good food (and even have a clay oven to prepare delicious meals), knew that breakfast or lunch at Maggie’s Cafe would fit our desire to experience the local, good food movement. Maggie’s Café is also known in Lincoln as Maggie’s Vegetarian Café (AND Maggie’s L.O.V.E. for Local, Organic, Vegetarian, Ethical). Our friends’ enthusiasm for Maggie’s was well-placed, and our delicious meal at this Nebraska café was clear evidence that farm-to-table dining options have taken root, not only in the green republic of Vermont and in Portland, Oregon, but in the American heartland. In fact, our expectations were met with what may be the best breakfast wrap in Nebraska especially for those of us who care about where our food comes from and how it’s produced. The deliciousness of ultra-fresh local ingredients was manifested in this outstanding vegetarian café’s offerings. A brick-faced store front which is eclectically decorated and cozy, Maggie’s reminded me of a food stall at Philadelphia’s famous Reading Terminal Market. In business for 16 years, Maggie’s is no newcomer to satisfying the public palate. The café offers more than a half dozen different wraps, which are prepared with 12″ flour tortillas (for an additional $1.00, whole wheat is available). 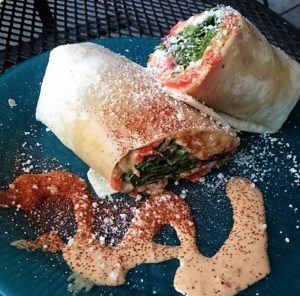 We opted for the Three Cheese Melt wrap which combines Jisa Farmstead cheddar, provolone and mozzarella cheeses, roasted sunflower seeds, Shadow Book Farms mixed greens, spinach, garden tomatoes, and roasted red pepper dressing. A smear of dressing and a sprinkle of parmesan adorned it, setting the mouth to water just from the pretty picture before the scents of bubbling cheese, fresh greens and tomatoes even hit my nose. We also shared Maggie’s Nut Meat Tacos made with Jisa Farmstead cheddar, tomatoes, onions and dolloped with avocado cream sauce. 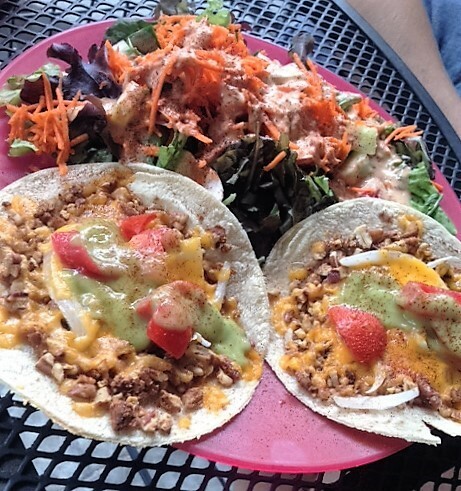 The tacos were accompanied by a beautiful fresh salad with Shadow Brook Farms greens, carrots and cucumber. Often prepared with ground and seasoned walnuts, the delicious nut meat tacos on the day we ate at Maggie’s were made with ground pecans. Other menu options included a Free Range Frittata, Southwest Black Bean Casserole, and Roasted Veggie Pizza. And the café’s 2012 Food Network Magazine award winning Avocado Melt Wrap is a favorite of customers. According to the café’s website, Maggie “is one of the founding members of Slowfood Nebraska” and has attended the Terra Madre conference in Turin, Italy as a delegate of Nebraska. 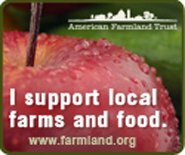 The café notes its “pride” in working with local farmers and organizations which support sustainable agriculture. With impressive plating and ultra-fresh flavors, Maggie’s delivers a taste of the Slow Food vision in the heart of America. And the café deserves praise for its ever-growing network of local food businesses and farmers that work to support one another. Maggie’s sources ingredients from many local producers by utilizing Lone Tree Foods (an innovative food distributor which connects its members, who are “sustainable farmers”- well defined on its website, with buyers, particularly in Lincoln, as well as Omaha, the largest city in Nebraska, and Council Bluffs in Iowa), Robinette Farms (for eggs), Le Quartier Baking Company (for pizza crusts), Wise Oven Bakery (for sourdough breads), and Marlene Tortilleria (for corn tortillas), in addition to Jisa Farmstead and Shadow Brooks Farm noted above.